Do you have high employee turnover? Are your employees quitting? Employees don’t leave companies. They leave their bosses. We each have five personal human needs to meet before we feel content as human beings according to psychologist Dr. William Glasser. 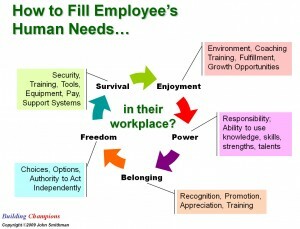 As supervisors, we can design a worker’s environment to help them meet these five needs. SURVIVAL. This need is served by good food, air, water, health, safety, security, strength, money and systems to support an employee’s well-being and skill development. Provide a healthy workplace and appropriate training. ENJOYMENT. This need is served by a healthy environment, coaching and training, emotional fulfillment and growth opportunities. Balance work with fun. POWER. The need for power and control is served by responsibility and good use of our knowledge, skills, strengths and talents. Assign roles (with responsibility) to all employees. BELONGING. People need to feel like they belong to something worthwhile. Provide grouping opportunities. Create and Assign work to teams. Training provides links for employees. Recognize and appreciate good employees at every opportunity. FREEDOM. This can be freedom of choice, or authority to act independently. Good supervisors pay attention to their employees and help them to meet their human needs in a constructive and positive way. Allegiance is earned in high performance workplaces. The book Workplace Champion By Example: creating a workplace where people matter! can help you build employee allegiance through your good leadership skills as a champion supervisor. Do you have a copy?